The technical picture for spot price silver is very simliar to that of gold ( over the last two days ) with a shooting star candle having been followed yesterday with hanging man, both of which suggest a bearish tone entering the commodities market for these two metals, and as a result we can expect to see a pullback in prices in the next few days. In the case of silver, we now have a deep and solid potential support level directly below which should provide a strong platform for any move lower, with the moving averages provding the first line of support in due course. 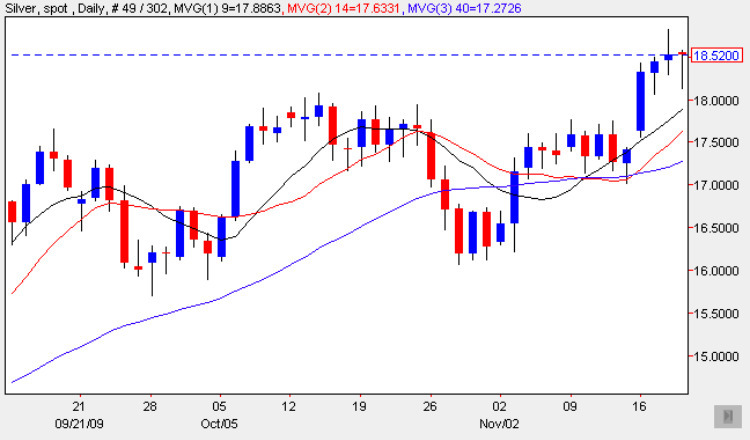 Given the depth of the support below it seems unikely that any move lower will be more than a re-test of the suport in the $18 per ounce level, and should this hold as expected then the breakout of earlier in the week will be confirmed in due course, with silver prices continuing to move higher in the next few weeks and into the new year.